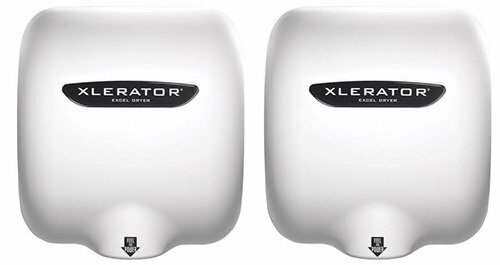 The XLERATOR XL-BW 110/120V automatic hand dryer has a 1.1 noise reduction nozzle, a one-piece white reinforced thermoset polymer cover, and uses a high-velocity air stream and contoured nozzle to dry hands in an average of 10 seconds. An automatic infrared optical start/stop sensor runs the dryer for 35 seconds or until hands are removed from under the sensor. This surface-mounted, hard-wired hand dryer meets several GreenSpec standards, is certified by Greener Product LLC, endorsed by the Green Restaurant Association, and earns Leadership in Energy and Environmental Design (LEED) credits with the Green Building Certification Institute. The 1.1 noise reduction nozzle cuts the sound level by up to 9 decibels (dB) and keeps it under 90 dB. The dryer has a five-year warranty covering factory performed labor and repair or exchange of defective parts (at the manufacturer's option). The hand dryer measures 12-11/16 x 11-3/4 x 6-11/16 inches (H x W x D). (H is height, the vertical distance from lowest to highest point; W is width, the horizontal distance from left to right; D is depth, the horizontal distance from front to back.) Hand dryers use high-velocity air streams to remove water from hands. They are an alternative to cloth or paper towels, and are often used in public facilities. Excel Dryer, Inc. manufactures hand and hair dryers. The company is headquartered in East Longmeadow, MA. High-speed, ENERGY EFFICIENT hand dryer. 10 Second Dry Time! Adjustable Heat and Speed Option.